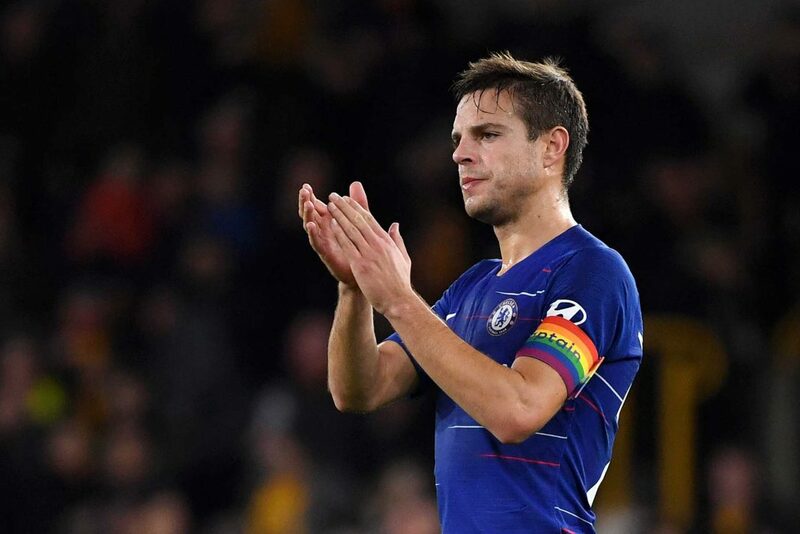 Cesar Azpilicueta applauds fans during the Premier League match between Wolverhampton Wanderers and Chelsea FC at Molineux on December 4, 2018 in Wolverhampton. December is always a busy month for fixtures, and on Wednesday night, Chelsea travel north to face Wolverhampton Wanderers. Chelsea will want a victory to keep pace with the teams around them with a victory over Wolves at Molineux Stadium ahead of the visit of Manchester City on Saturday. Maurizio Sarri reported there were no new injury concerns ahead of Wednesday night’s match, even though Mateo Kovacic and Marcos Alonso were substituted against Fulham with minor injury problems. Sarri will likely have to make some changes in order to keep the squad fresh, and one player giving the Chelsea manager a good selection headache. Ruben Loftus-Cheek came on as a substitute to score Chelsea’s second goal against Fulham, giving the midfielder five goals in his last six appearances in all competitions. Sarri confirmed that he’d like to keep Loftus-Cheek into the next calendar year, so it’ll be interesting to see if Loftus-Cheek earns his first start in the Premier League this season on Wednesday night. Wolves, meanwhile, find themselves in a different position. After a good start to the season, Wolves haven’t recorded a win for almost two months, and Nuno Espirito Santo’s side have slipped to 13th place, albeit seven points above the drop zone. One major problem for Wolves is their inability to score goals. Wolves have only scored 13 goals in the Premier League this season, and Raul Jimenez has scored just three times and looked ineffective at best. Compounding Wolves’ issues, Ruben Neves is suspended for Wednesday’s match after picking up five yellow cards this season. How Nuno Espirito Santo fills the spot next to Joao Moutinho is anyone’s guess, but he’ll need to come up with a good solution or his team could easily be overrun by Chelsea’s midfield. This should be an away victory for Chelsea, but at their best, Wolves are a tricky proposition because they tend to stretch the pitch to make space. They earned a draw by doing that against Manchester City, but they haven’t quite reached those heights since. If Chelsea don’t get complacent, they should be able to come away with three points on Wednesday night.